“Easter was a cracking weekend for us, and I am very pleased that we exceeded 600 pre-supports. My thanks to all who have helped us get to this substantial number, it is evidence of the hard work and enthusiasm that people have for our Bid. 600 pre-supports is a phenomenal start to our campaign to bring Worldcon to Dublin. Our whole Committee and many Volunteers were involved in a wide variety of activities over the Easter weekend, and that was wonderful to see. The synchronicity of having teams working tables in London and Seattle, some 4,700 miles apart, meant that we were open more than we were closed over the Easter weekend! Many of these pre-supporters have also volunteered, and we hope to build on this positivity and work hard at gaining more support as we go forward. The positive words and feelings towards the Bid were really nice to experience from all angles. It’s clear from our conversations with you that Fans want us to succeed, want to help us succeed, and many of you have made this known by paying your hard earned cash towards the shared goal of seeing a Worldcon in Ireland. We have a lot of work to do, but it is exciting to see so many people weighing in behind our Bid so early, and it was obvious that our teams were enthused and empowered by this tangible demonstration of support”. Supporters are an essential element of our Bid. 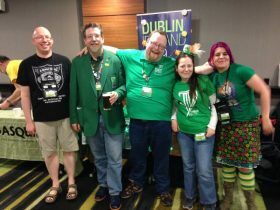 They – you – help to make us formidable as we work to bring Worldcon to Dublin in 2019 (rarrrrr!). We’re grateful for any level of support – from pledging money, to kind words, wearing our stickers at conventions, liking us on Facebook and Twitter, and efforts to help us by making posters, writing blog posts, staffing tables at conventions, spreading the word and all the little invisible things that need to be done when running a Worldcon Bid. Fans from around the world have already helped us in many different ways, and we’re incredibly grateful for this. We really hope that the huge amount of supporters that we already have is indicative of how awesome a Worldcon in Dublin 2019 would be. Onwards to victory!